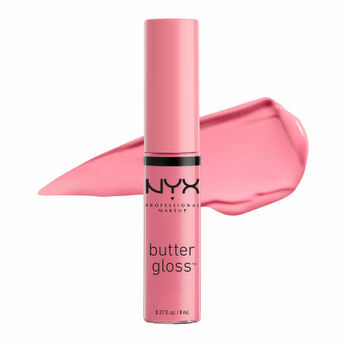 Buttery soft and silky smooth, the scrumptious new NYX Professional Makeup Butter Gloss tastes as sweet as a sugar cookie - and makes your lips look downright luscious. Swipe it on alone or over your favorite NYX Professional Makeup lipstick for creamy sheer to medium coverage that melts onto your lips. Soft and Silky Smooth Butter Lip Gloss. Having a Lightweight formula and being non-sticky, NYX Professional Makeup Butter Gloss leaves your lips soft and supple. Every glossy colour delivers sheer to medium coverage. Additional Information : Dazzle your lips with ultra-creamy, smooth and silky finish NYX Professional Makeup Lip glosses ranging in full, medium or sheer coverage to pick from varied super matte, glossy, or glitter finish. Lavish your lips with gloss-bursting and scrumptious NYX Professional Makeup Butter and Intense Butter Gloss in buttery texture melting onto your lips with amazing coverage and variety of fun colours to choose for all skin types. Explore the entire range of Lip Gloss available on Nykaa. Shop more NYX Professional Makeup products here.You can browse through the complete world of NYX Professional Makeup Lip Gloss .